The Disneyland Resort will host the Disney Channel Fan Fest at Disney California Adventure on Saturday, April 27. This one-day event features presentations, previews, panel discussions, musical performances and Q&A sessions with stars of Disney Channel series and movies. Productions to be featured during the Fan Fest include Descendants 3, Zombies, Kim Possible, Andi Mack, Raven’s Home, Sydney to the Max, Coop & Cami Ask the World, BUNK’D, Bizaardvark, and the upcoming Just Roll With It. The Disney Channel will live-stream the opening cavalcade and all of the Main Stage sessions on the DisneyNOW Disney Channel YouTube channel and the Disney Channel Facebook page. Some of the performers will welcome fans during meet-and-greet opportunities throughout the day. You must obtain a wristband to participate in a meet-and-greet. Disney will distribute wristbands on a first-come, first-serve basis starting at the 8:00 a.m. park opening on Saturday, April 27. Valid theme park admission is required to enter the park. Disney announced in February that the former ESPN Zone space in Downtown Disney would reopen this spring as "Pop-Up Disney! A Mickey Celebration." Tickets are now on sale for this made-for-Instagram installation, which opens Friday, April 26. 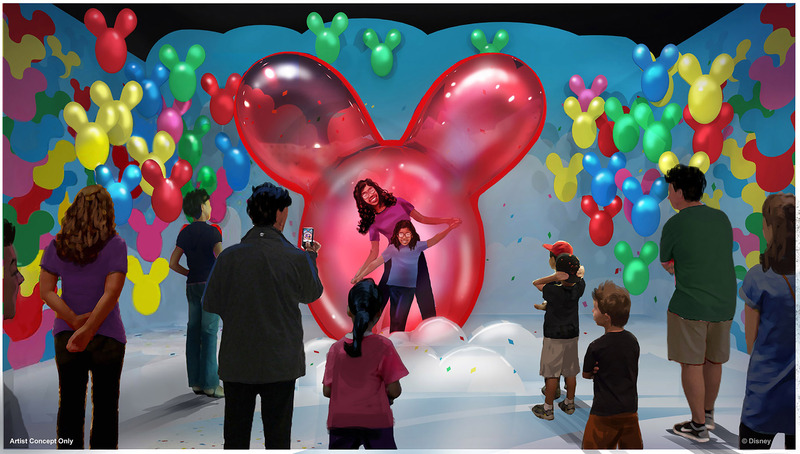 As part of Disney's 90th anniversary "World's Biggest Mouse Party," Pop-Up Disney! will provide a series of picture-perfect themed rooms inspired by Mickey and Minnie Mouse. Disney says the experience will take about 90 minutes, after which you can browse the Pop-Up Disney! gift shop, or head to Marceline’s Confectionery for themed snacks. Pop-Up Disney is scheduled to open April 26 in Downtown Disney. Photo © Disney. Tickets are $30 for weekdays (Monday through Thursday) before 4:00 p.m., or $35 per person all other times. The venue is open daily from 10:00 a.m. to 9:00 p.m. When you order your tickets, you pick the date and time you wish to visit, with tickets sold in 10-minute intervals. The final reservation is for 8:50 p.m. each night. The retail store remains open until 11:00 p.m. The ticket includes an unexpected perk: up to five hours complementary parking on Downtown Disney. Pop-Up Disney! guidelines differ from those for the Disney theme parks: Food, drink, strollers, tripods, and selfie sticks are not allowed inside the attraction. Missing your time slot invalidates your ticket. Disney asks you to arrive on time, but no earlier than 15 minutes before your ticketed slot, to allow for parking and security screening. Both parks will feature an exciting new attraction where guests of all ages can join the heroes in action. We are expanding our story universe by creating a new organization, the Worldwide Engineering Brigade, to be our setting for this experience. Though WEB is grounded in classic characters like Peter Parker, it is an organization that we can all be a part of—one that invites us to engage with these iconic heroes like never before. Besides introducing WEB, we can’t wait to debut a brand-new, cutting-edge interface as part of this fun, interactive attraction. Through a blend of never-before-seen technology and practical effects, guests will get to experience for themselves what it is like to have the abilities of a Super Hero. The article also noted that Spider-Man will soon appear in a new suit at Disney California Adventure. The costume has already debuted at Disneyland Paris, and will roll out to other meet-and-greet opportunities with Spidey in the future. ...Grizzly River Run is scheduled to reopen on Friday, March 29 following annual refurbishment. 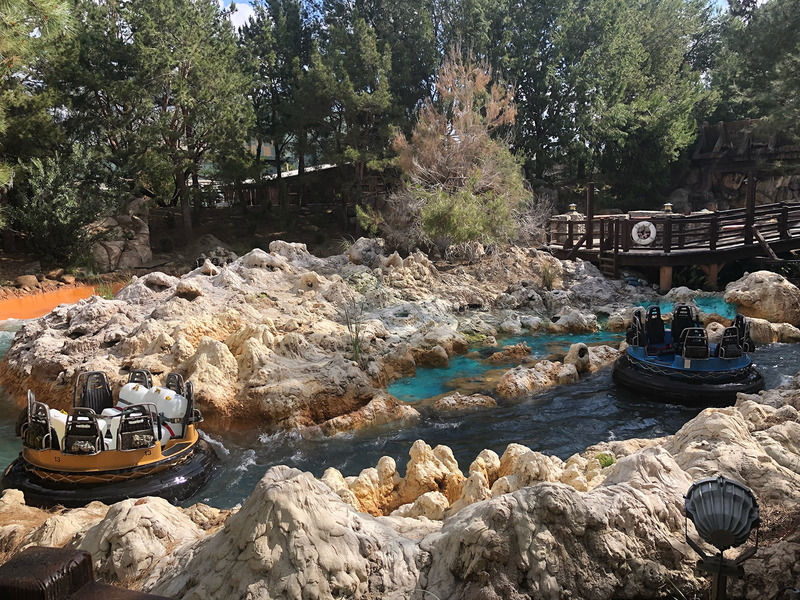 Disney is using rafts with water weights to test Grizzly River Run ahead of its scheduled reopening. Photo by Todd Pickering. ...Tickets are still available for the two Disneyland After Dark: Heroes Assemble events, on Tuesday, April 30 or Wednesday, May 1. This event takes place at Disney California Adventure, which is the future home the Super Hero-themed land Disney has said will open in 2020. Tickets for the events are $109 per person. Visit the event website for more details and to purchase tickets. Astro Orbitor – closed through April 4 for refurbishment. The Briar Patch (shop) – closed April 15 through at least May 5 for refurbishment. Sleeping Beauty Castle Walkthrough – closed through at least May 5 for refurbishment. Sleeping Beauty Castle Enchanted Chamber – closed through at least May 5 for castle refurbishment. Grizzly River Run – closed through March 28 for refurbishment. Silly Symphony Swings – closed through at least May 5 for refurbishment. Red Car Trolley – closes April 1 through at least May 5 for refurbishment. Sugarboo & Co – scheduled to open later this year in the space most recently used as a Disney Vacation Club sales office. Disneyland After Dark: Heroes Assemble at Disney California Adventure – Tuesday, April 30 and Wednesday, May 1. Tickets on sale now. More information on the event website.